Honors projects provide an opportunity for students to integrate their education and focus it via a significant research and writing project, including a challenging oral defense. The History Department strongly encourages History majors to study off campus. In 2016-7, more than half of our graduating seniors followed up on their study away experiences in their senior capstone research projects; recently, students have also been inspired by off-campus public history experience to procure museum internships and apply to graduate programs. Because so many Study Abroad programs offer unique opportunities to study regional histories in depth, the History Department does not have recommendations of particular programs at this time. Our majors have taken advantage of Macalester’s diversity of off-campus opportunities (most recently studying overseas in Turkey, Scotland, Denmark, Argentina, Greece); they have also enrolled in domestic programs such as the ACM Newberry Program in Chicago, which offers opportunities for students pursuing fields such as Native American Studies to research in a new setting. If you are interested in studying off campus as a History Major, we suggest that you speak to the History Department Faculty Liaison about your particular chronological and regional interests, especially if those interests involve an area that does not currently have coverage in the Macalester History curriculum. Our Faculty Liaison can help you locate a suitable program and also put you in touch with recent alumni or returning students who can offer firsthand opinions about how the programs they attended have contributed to their History major and their lives post-Macalester. The History Department has funding available to help defray expenses incurred by students for their research projects. Our department is often asked to share information from other organizations with our students. We consolidate that information here for your convenience. However we have not thoroughly researched every one of these announcements. If you are considering any opportunity listed here, exercise caution, and if you have questions, please talk with a faculty member in the department. (C) 4/15/2019 Process Journal Issue On Kinship Now Live and Call for Papers. Process: Journal of Multidisciplinary Undergraduate Scholarship has released their latest issue, On Kinship, and is looking for submissions for their next, On The Future. The journal publishes undergraduate work in a variety of disciplines. More information can be found on the website. 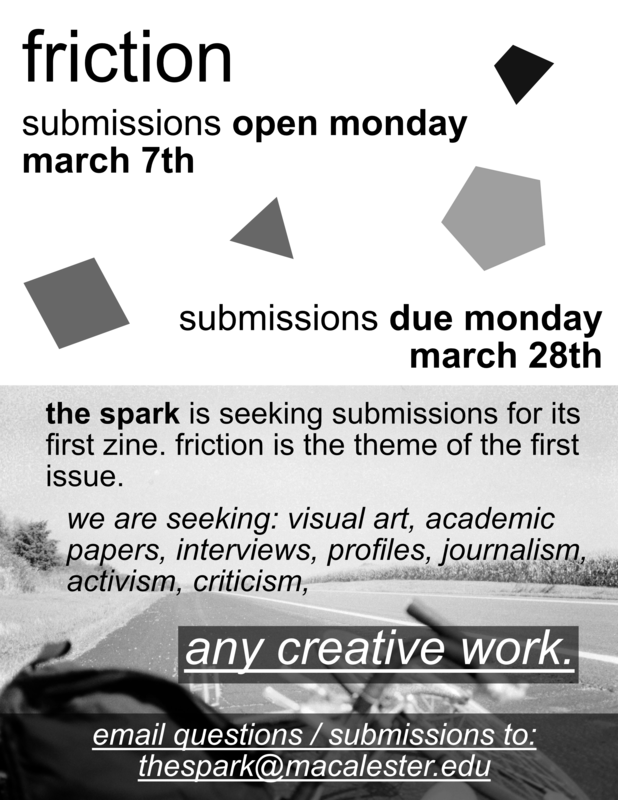 Submissions are due May 27. The French and Francophone Studies department is hosting “African Literature at the Crossroad of Languages” which will be held in Neill 226 on April 15. Acclaimed Senegalese novelist, essayist, and journalist Boubacar Boris Diop will speak about the challenges of African literatures written in colonial, global, and national languages. For more information, see the poster. The Journal of Politics & Society is the United States’ premier interdisciplinary journal of undergraduate scholarship in the social sciences, published by the Helvidius Group of Columbia University. The Editorial Board of the Helvidius Group is seeking submissions of scholarly research from undergraduate students in colleges and universities around the world, from our home here in New York to Illinois to England to Singapore. Current undergraduates and recent graduates may submit work they completed as undergraduate students. Students from all social science disciplines are encouraged to submit their work. Click here for more information and the deadline to submit a paper for the Spring 2020 issue is August 15, 2019. On Tuesday, April 23rd, join Doctors Without Borders/Médecins Sans Frontières (MSF) for a recruitment information session in Minneapolis, MN. This is a great opportunity to meet their recruitment team and learn about how you can join MSF’s pool of dedicated aid workers. They are currently recruiting for a variety of medical and non-medical positions. The Yale Historical Review is an undergraduate journal that publishes original research in History and related topics with historical focuses bi-annually. Our organization is currently looking for submissions for our Spring 2019 issue. Please send your submission to yalehistoricalreview@gmail.com with the subject line “Essay Submission” and the file title “YHR Spring 2019 Submission.” Click here for more information on the requirements for your submission. Papers will be accepted on a rolling basis until April 15th at 11:59pm. 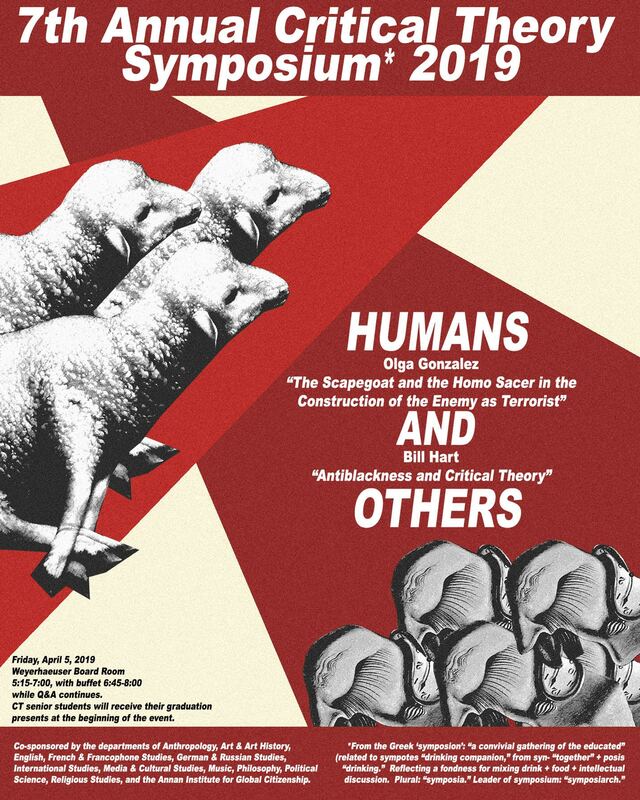 The Critical Theory Symposium will be held at 6:45 pm on Friday, April 5 in the Weyerhaeuser Board Room. Macalester professors Olga Gonzalez (Anthropology) and Bill Hart (Religious Studies) will be giving lectures. There will be a buffet and graduating Critical Theory concentrators will receive their graduation presents. See the poster for more information. The Macalester Jewish Organization hosts Earl Schwartz, a lifelong citizen of the Twin Cities and student and teacher of Jewish literature and history (and faculty at Hamline University) for a talk on the history of Jewish community in the Twin Cities. All are welcome! 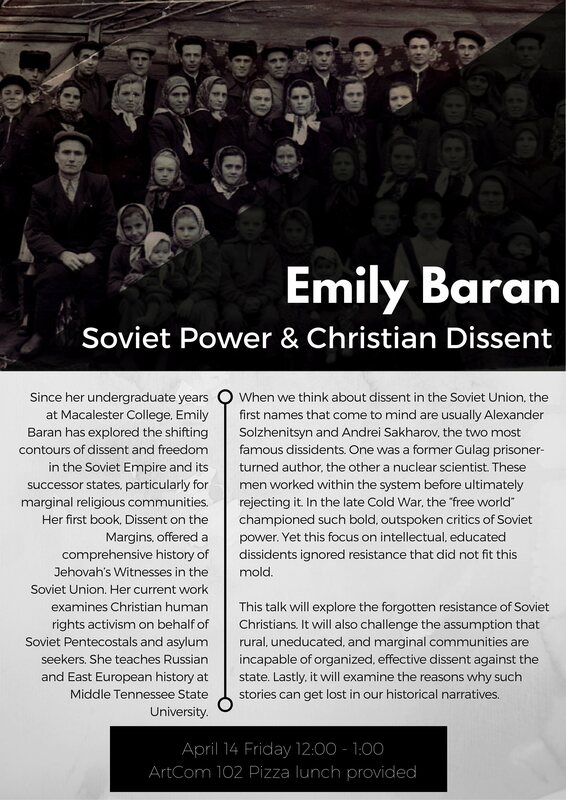 The talk is on April 2, 2019 at 9pm in Kirk 8 Lounge. The INCE Fellowship encourages Twin Cities undergraduates from diverse communities to explore the challenges within museums, historical organizations, and cultural institutions as they relate to inclusion, representation, narrative, and the workforce. The program is designed to encourage more students from underrepresented communities to consider working in the museum field and consists of three major phases: 1) 3-credit course in the Fall, 2) museum trip to Chicago over winter break, 3) paid internship with cultural organizations in the Spring. View this page for more information and apply as soon as possible! The Minnesota Historical Society offers summer internships in a number of areas and historic sites. The applications are open from now until March 24. For more information and to apply, see the opportunities page on the Minnesota Historical Society website. World Without Genocide is a human rights organization. It has openings for full year Operations and Advocacy internships for Fall 2019-Spring 2020. The internships are unpaid but academic credit may be arranged. Applications are due April 25. More information can be found here or on the World Without Genocide website. Applications for the National Museum of American History’s Special Events summer internship are due on April 1, though application review will begin on March 25. This internship is unpaid, but offers a $500 stipend to help with travel and transportation expenses. More information can be found here and here. To apply, see this page. The dual MA/MSc in International and World History at Columbia University and the London School of Economics is calling for applications this spring. At the heart of the program is the two year dissertation, an original scholarly work based on empirical research and analysis. Students spend the first year in New York and the second year in London, receiving degrees from both institutions. Applications are due by March 15, 2019. More information can be found on the flyer. The Hmong Museum is showing a film about the Hmong Special Guerilla Veterans and their experiences. After the film, there will a panel discussion with filmmakers and the veterans. This is an opportunity for students to learn about documenting history and producing a film. The film is showing on Thursday, March 14th at 6pm and the address is 626 University Ave W. Find the flyer for the event here. The East Side Freedom Library and Ramsey County Historical Society are hosting an interactive lecture/discussion with Elizabeth Duclos-Orsello about her new book, Modern Bonds: Redefining Community in Early 20th Century St. Paul. The book considers how everyday practices united and divided citizens across lines of gender, class, and race while remaking the definition of “community.” Books will be available for purchase and signing. No reservations needed. The event will be on Tuesday, March 12 at 7 PM. More information can be found here or on Facebook. You will help support Hallie Q. Brown’s growing Historical Archive and the preservation efforts around the historic Rondo neighborhood. As a volunteer, you can support with the digitization of photographs, recording conversations, transcribing interviews, and fulfill the ongoing organizational needs of the project. This opportunity is ideal for those interested in historic preservation, American history, cultural or anthropological studies, and urban planning. This opportunity will be on Mondays from 7:45 to 9:30 a.m. (Transportation time included). Email cec-economicjustice@macalester.edu if interested! Applications for the Bard College Master of Arts in Teaching (MAT) Program are now open. Bard MAT is interested in recruiting students interested in history who want to become middle or high school social studies teachers. The program gives equal weight to history and education in its curriculum. The program also works with partner schools in the area. Apply here by April 30. More information can be found here and on the website. (I) 2/12/2019 Intern at the Brookings Institution in Washington, D.C.
Are you at least a Sophomore? Macalester students and young alumni have been invited to participate in a recruitment process for paid summer internships for candidates underrepresented in policy research (defined by Brookings as women, students of color, LGBTQI+ students, students with disabilities, and first-generation students). Applications are due in Handshake by February 20th (including a writing sample and unofficial transcript), and internships will be filled by late March. The 2019 Macalester Summer Internship Grant Program will provide funding to support 30-35 Macalester students doing invaluable 10-week unpaid summer internships anywhere in the world. The selection committee will prioritize confirmed internships that have the potential to be highly impactful on one’s studies and career. Accordingly, it is very important that you plan ahead and set up a great experience as early as possible. Application deadline is 11:59pm on March 25. This year, the Macalester Job and Internship Fair will be on Tuesday, April 2, from 11:30-1:30pm. More than 40+ organizations will come to Macalester to recruit students for internships and full-time roles. Walk-ins are welcome and the full details can be found on Handshake. The Careers in Law Fair is happening Wednesday, March 6 at the University of Minnesota-Twin Cities West Bank. Career and info fair featuring employers including government, legislative offices, non-profits. Test prep and 12+ law schools will also be present. Click here for more information. There are several alumni-posted opportunities in Handshake for current students. “Special for Mac” opportunities are internships and/or research that are not located at Macalester but are being hired in partnership with Macalester. Current partner organizations include: Princeton University Art Museum, Brookings, National Geographic, Wilder Foundation, Open Secrets Project, Twitter, Wisconsin Project, the U.S. State Department & the U.S. Department of Fisheries & Wildlife. Full details in Handshake by searching jobs with “HireMac”. On Thursday, February 14 from 7-9 pm in Davis Court, Kyera Singleton (Class of 2011), will lead a scholarly conversation titled “NARRATING BLACK WOMEN’S INCARCERATION AND RESISTANCE” in dialogue with Prof. Crystal Moten (History), and Guy Chinang (Class of 2020). Prof. Moten teaches 20th century African American History. On Saturday, February 16 from 10am to 12 noon in Davis Court, organizers with MPD150 will present an interactive talk and workshop on their project, “A People’s Evaluation of the Minneapolis Police Department” MPD150 is a participatory effort by Minneapolis-based organizers, researchers, artists and activists to create a police-free future. (J) 2/6/2019 Historic Fort Snelling at Bdote is hiring for site guide positions. Fort Snelling is hiring sit guid positions with backgrounds in Native American, African American, and/or Japanese history and culture. The summer program is set up in areas that concentrate on specific information. For instance, there is an area that concentrates on the site as Bdote—a sacred site of Dakota creation. Programming also focuses on Indigenous history at the site stretching back thousands of years and that the site resides on Dakota homeland. Another station concentrates on trade, including before Europeans arrived on the continent. Click here for more information or visit the MN Historical Society Jobs website. Do you want to live on campus next year? Are you interested in being a part of a meaningful, intentional community? Interfaith House at Kirk 8 allows for students to live out the fullness of their religious, cultural, spiritual, moral, and philosophical traditions in relationship with others. Interfaith House seeks to foster creative discussion and dialogue across difference for students of diverse commitments from the world’s religions, as well as seekers, agnostics, and humanists. By living together in intentional community, we seek to create a safe environment for exploration, mutual understanding, and relationship building. Learn more here and complete an application by February 14th, 2019. Questions? Email religiouslife@macalester.edu. Sign up to be a judge for History Day in Minnesota. Twin Cities, regional, and state competitions all need judges. Evaluating History Day projects is interesting and rewarding, and it helps young historians develop their skills and abilities. History Day judges review entries in their preferred category, provide feedback to students, and select which projects advance from the Regional and State competitions. The time commitment can be as little as one five-hour event or can extend to multiple competitions across the Metro area and greater Minnesota. Please contact History Day program manager Sarah Aschbrenner if you have any questions. (I)(R) 2/5/2019 Apply to The Boost It Fund! The Boost It Fund is for those in the process of scaling businesses, nonprofits, & community projects. Entrepreneurship at Macalester can offer a boost to power through roadblocks with funding and mentorship. We are looking to support students who need more resources to continue to push their idea forward. All applications are due March 24 at 11:59pm. An information session will be on February 7th from noon to 1pm, in Library 250. Free lunch will be provided. (I)(R) 2/5/2019 Apply to MacNest! MacNest is a 10-week internship program where students receive funding to intern at Twin Cities startups. This program allows students to work closely with a founder in a complex, demanding work experience while deepening Macalester’s connections and influence in the Twin Cities startup ecosystem. Student’s will also participate in career development workshops once a week to connect their internship experience to vocation. They will also be a part of the Summer Idea Showcase and the MacNest showcase where they will be sharing their stories and experiences. All applications are due on February 10 at 11:59 p.m. An information session will be on February 7th from noon to 1pm, in Library 250. Free lunch will be provided. (I)(R) 2/5/2019 Apply for MacStartups! 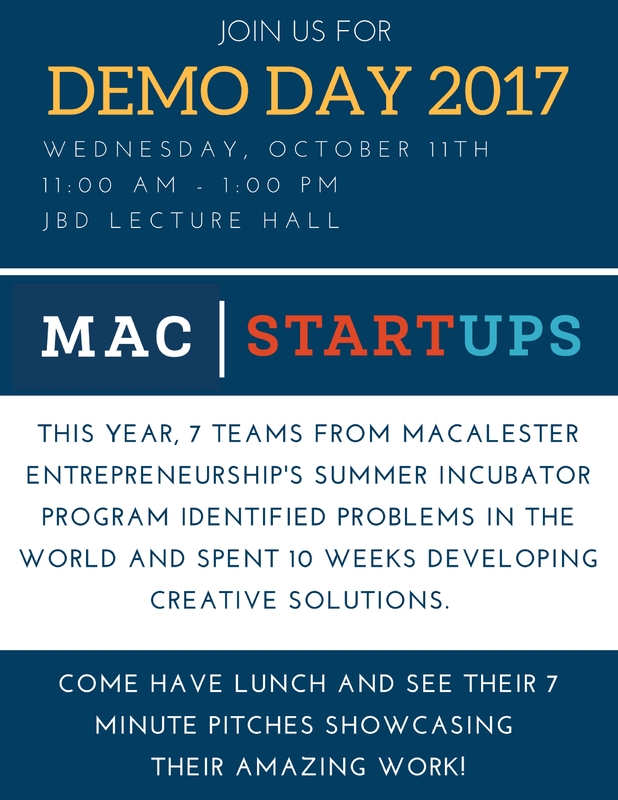 MacStartups is a fully-immersive, 10-week intensive program designed to incubate the development of Macalester student entrepreneurial ideas. In addition to funding, student entrepreneurs are provided work space, professional advisors, expert speakers, and workshops. They will also participate in two networking showcases, the Summer Idea Showcase and MacGo, to pitch their ideas to a large audience of investors and members from the local startup community and Macalester. This program is open to all students who are currently enrolled and graduating Seniors. All applications are due on February 21 at 11:59pm. An information session will be on February 7th from noon to 1pm, in Library 250. Free lunch will be provided. Sign up for the Minnesota Private College’s Job and Internship Fair on February 21st, 2019. to meet employers and recruiters in a low-stress environment, learn about opportunities you didn’t know existed, and find jobs or internships in business, nonprofit, science and government fields. The deadline to register is February 8th, 2019. Click here to view more information. The Institute of Reading Development offers summer reading skills programs in partnership with the continuing education departments of more than 100 colleges and universities nationwide. Each year we hire hard-working, encouraging people with a passion for reading to teach our summer programs. The Institute is seeking applicants from any academic discipline. All applicants must have an undergraduate degree or higher in their field before the start of our teaching season. To apply please visit here. Process is currently accepting submissions for its next issue, On Kinship. The journal seeks work that uses kinship, broadly understood, as a framework for thinking about human relationships and how we conceive of our connections and disconnections to one another. To submit a paper please visit here, and send in your submission by February 4th, 2019. Hemispheres: The Tufts Undergraduate Journal of International Affairs calls for undergraduate submissions for research articles, approximately 5000-8000 words in length, written in a broad range of fields relevant to international affairs. To view paper requirements and guidelines, visit this link. To submit a paper, or if you have any questions or concerns, please contact hemispheres@tufts.edu. Deadline is extended to February 8th, 2019. Two William Randolph Hearst Fellowships are available for Summer 2019, for undergraduate or graduate students interested in American Studies, U.S. History, Museum Studies, or Education. The Mount Vernon Hotel Museum & Garden is a historic building in New York City, built in 1799, presents the story of the hotel and interprets the 19th-century time period in New York and American history, focusing in particular on the 1820s and 1830s. Hearst Fellows will conduct original research about NY history, work as interpreters, and assist with summer children’s programs. For more information, please look at this page on the Museum’s website: http://www.mvhm.org/get-involved/, and then select “Fellowships” from the left-hand menu, andalso see details in the application linked here. Applications due March 11. The Humanities Education and Research Association 2019 Conference will be in Philadelphia 6-9 March. The theme is Highbrow, Lowbrow, No-brow: Research and Aesthetic Values in the Humanities. Find the flyer here, and the website here. Deadline: January 31st, 2019. Tufts Historical Review is an academic journal of global history that seeks both undergraduate and graduate papers of the highest caliber. This year, the theme is Muses. “The development of humanity is a story of extraordinary accomplishments by remarkable people. Behind every one of those people is a source of inspiration, be it religious, political, or personal. Every story has its muse.” The Editorial Board seeks outstanding articles – between 2,500 and 8,000 words – that explore our theme from a diverse array of perspectives. Submissions are due by (was 31 January, now extended to) February 8 2019, and should be submitted to tuftshistoricalreview@gmail.com. Applications for NYU’s MA in European and Mediterranean Studies Program are now available. The degree can be completed in 12 months (2 semesters and a summer session) with joint degree options also available. For more information about the program and how to apply, visit the NYU Graduate Studies Website. Students design their own programs, and can choose courses related to modern European topics in Arts and Sciences, the School of International and Public Affairs (SIPA), and the Law School. The degree is designed for students going on to graduate and professional schools and to careers in business, government, law, and the nonprofit sector. The program can be completed in 12 months but part-time study is also possible. The European Institute offers financial support to its students. Find more information about the program at ma.europe.columbia.edu. Deadline March 15, 2019. The PhD Program in Classics at Johns Hopkins is currently accepting applications. The deadline for application for fall admission is January 15, 2019. Detailed information and application procedures can be found at http://classics.jhu.edu/graduate/. Hemispheres, The Tufts Undergraduate Journal of International Affairs is now accepting submissions relating to this year’s theme of Global Visions, Local Interests. Submissions should be research articles, approx. 5000-8000 words, written by undergraduates in a broad range of fields relevant to international affairs. To view paper requirements and guidelines, please visit this link. 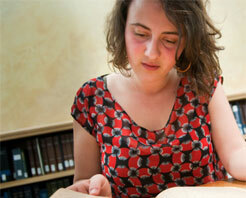 History alumna Molly Brookfield is pursuing a PhD. at the University of Michigan, and forwarded info about their MICHHERS program that might be of interest to seniors or recent History grads. She has heard great things about the program from past participants and faculty. And she would also be happy to talk to any students who are interested in pursuing a PhD in History (or Women’s Studies) at Michigan. For her contact information, please check with the history office. Students interested in pursuing a PhD in History or Women’s Studies at University of Michigan can also look at the MICHHERS flyer and the MICHHERS handout. For more information about their HSTM graduate field, please see https://history.illinois.edu/science-technology-and-medicine; for general information about the graduate program in the Department of History, see https://history.illinois.edu/academics/graduate-studies/prospective-students-welcome-and-overview. The Scott County Historical Society, located in Shakopee, MN, has several internship opportunities opening up. All have an application deadline of February 1st, 2018. Please see the flyers for the house program, exhibit, library inventory, and gallery exhibit positions. The talk, entitled “Human Rights in Israel and Palestine: New Approaches” will explore the organization’s monitoring of human rights in Israel and Palestine, advocacy in the absence of a meaningful peace process, and conduct in the face of a one-state reality. Tuesday December 4th, 7:00 PM in Weyerhaeuser Chapel. The Gateway History Journal is looking for papers of 10-35 pages of length on any topic, region, or time period. Submissions are due by January 13, 2019 and should be submitted to pat.wustl@gmail.com. Please see the Gateway 2019 Submissions Flyer for more details. The Columbia Journal of Literary Criticism is seeking pitches and essays for its 2018-2019 issue, exploring the theme of “Revision”, to be published in the spring. Writers should either be current undergraduates or recent graduates submitting undergraduate work. For more information, see www.oneheartsource.org. Apply here for 2019 Programs: 2019 Application. Spring 2019 Internships run January through May and the application is open between now and November 15th. Interns can apply on the Historical Society website. (S) 10/31/2018 Apply for the January Live It Fund! Live it Fund supports students who identify an opportunity or problem and propose an innovative solution. Awards range from $500-$2000 in J-Term, followed by an opportunity to apply for summer funding of up to $10,000. Application deadline is Sunday, November 11 at 11:59 pm. Learn more and apply here. Applications for Fall 2019 are now open for the Columbia University and London School of Economics MA/Msc in International and World History. See the program flyer here. Network with established museum professionals at the University of St. Thomas Museum of Asmat Art, Thursday, November 8th at 6:00 pm. The event is free and all undergraduates interested in museum careers are welcome. Join the Macalester History Department at our annual Funk History Lecture on October 22, 6-7:00 pm, in the Harmon Room of the Library, where Doctor Burleigh Hendrickson of Dickinson College will present his talk “Globetrotters of the Mediterranean: From University Activism to Prison Reform in the Franco-Tunisian 1968.” See the talk flyer here. If the historian’s craft captured your imagination here at Macalester, you may be wondering if Grad School is right for you. A PhD program may seem like a logical next step, a chance to delve deeper, a haven. But what does Grad School entail? What does daily life look like as a historian-in-training? Join Mac alumna and Yale PhD candidate Naomi Sussman for a candid chat about the highs and lows of a PhD program and preparing to navigate the academe on Thursday, October 18 from 3-4:30 in the Old Main 4th floor lounge. 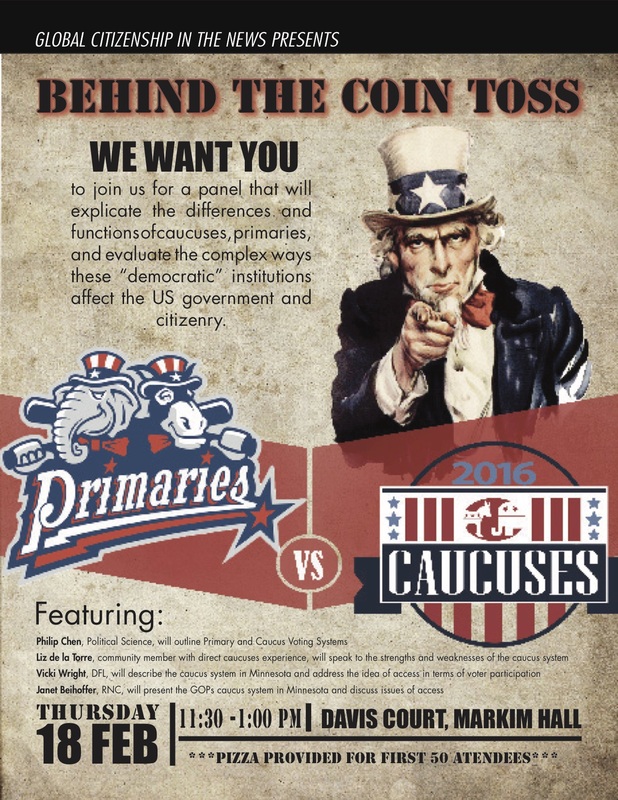 Read more about the event in this flyer. The CDC provides a weekly update to share opportunities relevant to History. Find the Oct 10 update here. The University of Kansas, offers a graduate program in Museum Studies. For more information please see the fact sheet, brochure and social media graphics. The Minnesota Historical Society is seeking students to serve as History Day mentors, and judges. Find a flyer about the paid mentorship program here. Macalester students can also serve as history day judges, as some did last spring, including judging the regional competitions. Paul Schadewald in Macalester’s Community Engagement Center can be contacted for details. They have provided a link for their online application. Find more information about MNHS History Day program on their website here. The Development branch of the Smithsonian’s National Museum of American History, the Office of Special Events plans and coordinates over 100 events each year including: exhibition openings, press conferences, donation ceremonies, staff receptions, donor cultivation events, and corporate dinners and receptions. The internship description can be found here. Additional information concerning qualifications, responsibilities, and learning objectives can be found here. Information about events at the Museum can also be found by visiting http://americanhistory.si.edu/museum/special-events. The application deadline is Thursday, November 1st. Fifty years ago, the United States was embroiled in political turmoil. Minnesota and its leaders were at the forefront of crucial events, including the presidential election. Fifty years later, the University of St. Thomas is hosting 1968 and the War for America’s Soul, and you are invited to examine and reflect on important issues of today. Michael Schumacher author of The Contest: 1968 Presidential Election and the War for America’s Soul will be the keynote speaker. Panels and breakout sessions will include the people who participated in the events that changed and shaped our state and country. Students and young leaders will discuss what the lessons of 1968 mean for today’s political moment and professional and student journalists will talk about the role the news media played then and now. Wake Forest University’s one-year program offers both a master’s degree as well as teacher licensure in secondary social studies. Please see the Wake Forest University MA Flyer and the Wake Forest University Letter for more details. Deadline 1/15/2019. The student organization, Voices on Mental Health, is hosting a few events this month surrounding grief, loss, and trauma specifically surrounding the grief process and how they can differ from person to person. Tuesday October 9th, 3:45-5:45 pm Idea Lab: Create Your Own Story Portrait; an art workshop with Laurie Phillips (Suicide Survivors Club illustrator). This is a drop-in style. Friday October 12th, 12-1pm Loch: A projected presentation of artwork by students on their grief and loss experience. (W) 10/5/2018 Tech IT Out in the Idea Lab! Tech IT Out is a new drop in series from the Digital Resource Center and Idea Lab featuring short, technology-focused sessions to help you level up your skills. Sessions will run on Thursdays from 4:40-5:00 pm. October’s Tech IT Out theme is “Adventures in 3D.” This week (Oct. 4) , drop in to learn how to use a 360 camera from 4:40-5:00pm. Next week, learn an easy-to-use 3D modeling app! The CDC provides a weekly update to share opportunities relevant to History. Find the Sept 27 update here. The update also refers to attached flyers. Find those here and here. The CDC provides a weekly update to share opportunities relevant to History. Find the Sept 20 update here. Find the Flier of TMORA September events here. The Minneapolis Institute of Art offers unpaid volunteer internships for individuals considering or pursuing careers in museum work. Candidates who have completed at least two years of college coursework and have relevant skills, interests or experiences are eligible to apply. Internships may last from one to twelve months, with a minimum time commitment of twenty hours per week. Intern positions are typically project-orientated within a specific department. The application deadline for Fall 2018 is June 1. For more information and to apply, visit the internship website. Angie Craig’s campaign for Congress is seeking interns. This field internship is a good opportunity for students to gain experience in political campaign work and leadership, as well as make a difference in Minnesota communities. No prior experience necessary. This internship is flexible, and hours and specific components of the position can be tailored to the intern’s needs and interest areas. This position is unpaid. For more information, see this flyer. Professor Andrea Kaston Tange and Kate Larson will be leading the next session of the First Thursdays series on professional and public lives after a Humanities degree on interviewing techniques. The session will help you prepare for both informational and job interviews, identify differences between the two, ask strategic questions, handle nerves, and highlight your skills during an interview. The session will take place on Thursday, April 5, from 4:45 to 6:15 PM in the Harmon Room. More information can be found here. NABS seeks to hire a current undergraduate or graduate student as an intern for the summer of 2018. The internship is a full‐time position over the course of 10–12 weeks (400 hours). Beginning and ending dates are negotiable. Salary will be $15.00 per hour. As temporary employees of NABS, interns are not eligible for employee benefits. View the internship announcement here. Have you had a professor who has supported your mental health and/or disability? Take a few minutes and nominate them for the 2018 Professor Appreciation Awards for Mental Health and Disability! This is a chance for us to publicly honor and thank our professors who have supported us at some point over the years as we navigate being students while living with the realities of our mental health and disability(s). Any comments will be sent anonymously to the professor, whose name will be published in a list of honored professors. To honor a professor, fill out this form. The Minnesota Historical Society is recruiting for a fellowship opportunity with their Department of Inclusion and Community Engagement (INCE). The INCE Fellowship Program (formerly known as the ACTC Fellowship) is a course that encourages undergraduates from diverse communities to explore the challenges within museums, historical organizations, and cultural institutions related to inclusion, representation, narrative, and the workforce. The program is divided into three parts: a 3 credit undergraduate course, a paid internship, and a trip to Chicago, Illinois. Interested students should contact Jae Yates, jae.yates@mnhs.org or Kyle Parsons at kyle.parsons@mnhs.org. Find the program flyer here and the application link here. The priority deadline for applications is March 23rd and positions are competitive so students should apply as soon as possible. Register to talk with Isabella Kulkarni ’13. Since graduating from Macalester, Kulkarni has been working as a reporter and producer on a host of different podcasts including The Ringer’s Slate, Gimlet’s Undone, Mogul: The Life and Death of Chris Lighty, and The Nod, and WNYC’s On The Media. She is also a freelance contributor for NPR’s Marketplace. This talk will be geared towards those with an interest in journalism/roles in media. She will discuss her journey into the industry and her work in new media startups, radio, and podcasting. She’ll let you know how her degree and graduate school helped her and suggestions she has for what she would have done differently. Isabella Kulkarni is a 2013 graduate of Macalester and a 2016 graduate of Columbia Graduate School of Journalism. The talk will be held in the DeWitt Wallace Library on March 29 from 12:00 to 12:45 PM. Only five out of ten spots are still available. Students interested in opportunities in publishing can attend the Minnesota Book Publishers’ Roundtable Internship Fair on March 27. Publishers will be on-site to answer questions, take resumes, and give brief informational interviews about opportunities available at their respective companies. This free event will take place in the Open Book (Target Performance Hall), 1011 Washington Avenue South, Minneapolis, MN 55415. Please RSVP on the website. Maggie Jackson, a member of the Mac Parent Board, will be available to talk about portfolio careers (when and why to depart from a “one job” model of a career, the benefits and pitfalls of being a free agent writer and author); how to write about what matters most to you; and how to balance time for deep thought with handling a social media presence. Jackson is an award-winning author and former Boston Globe columnist known for her penetrating coverage of social issues, especially technology’s impact on humanity. Her acclaimed second book Distracted jumpstarted our global conversation on the steep costs of fragmenting our attention and will be published in a new, updated edition in 2018. The recipient of numerous awards and fellowships, her essays and articles and books have been featured in the New York Times, Utne, National Public Radio, New Philosopher and many other publications worldwide. A graduate of Yale University and the London School of Economics, Jackson is at work on a new book about the reflective mind in an age of snap judgment. The event will take place in Markim Hall 201 from 12-1 PM on March 23. Join MacExplore for this trip over the the StarTribune in Minneapolis to meet with our alumnus Colin Covert, the paper’s film critic who specializes in feature writing and pop culture reporting. Colin will bring the group around their space and introduce the group to colleagues like Pulitzer Prize winning editorial cartoonist Steve Sack, somebody on the tech side, maybe photo, maybe newsroom management, and maybe Mike Klingensmith (Publisher and Macalester trustee). All class years and all majors welcome. There will be pizza in Kagin Commons at 11:20, and the group will leave from there by 11:40. If you are coming but won’t join for pizza in advance, please let Michele Moylan know at mmoylan@macalester.edu. The event will go until 1:25 PM. It is on March 8. Digging Up the Past uncovers the diverse, delightful, difficult, provocative, and unexpected stories from University of Minnesota’s Archives and Special Collections that have been unearthed as part of Umbra Search African American History’s effort to digitize nearly 500,000 African American history materials from across the University of Minnesota’s collections. The event is free and open to the public. It begins at 5:00 PM on March 19. Find out more and RSVP on the website. RSVP requested by March 12. The City of Saint Paul is looking for a summer Department of Planning and Economic Development intern. The work may involve economic development, geography, historic preservation, housing, and planning. The position is paid. More information can be found here. The application deadline is March 19. Students interested in working in middle or high school social studies teaching positions can apply to the Bard College Master of Arts in Teaching Program. Bard MAT’s curriculum gives equal weight to graduate study in history and education. Students at Bard MAT work both Bard supervisors and with mentor teachers at local public schools. More information on the program and the application can be found at this website and on this flyer. Applications for summer are due April 30. The National Park Service is accepting applications for its Tribal and Cultural Affairs Summer Internship. This paid, 11-week internship is a great opportunity for students majoring in Geography, History, and Anthropology. The internship will assist in the creation of a GIS-based Tribal Lands finding aid for National Park Service managers. This program is a professional development program that supports undergraduate and graduates students from underrepresented populations, who wish to gain exposure to and experience in the historic preservation/cultural resources fields of work. For more information, please visit the Handshake posting. Applications are due March 4th. (I) 2/16/2018 MacStartups Applications are now open! MacStartups is a 10-week fully-immersive summer incubator program open to current Macalester students. Working in a team of 2-3, students spend the summer using their creativity and super-powers to tackle a problem they’re passionate about solving while connecting with the Twin Cities entrepreneurship community. Teams will be selected based on their identification of the problem, creative solution, enthusiasm, and ability to work collaboratively. They are expected to develop the courage to take risks, learn methodologies and equip themselves with a toolkit, and work collaboratively with a cohort of fellow Mac students & integrate with the vibrant MSP innovator community. The application is now open and is due Sunday, February 25th. The Minnesota Transportation Museum’s collection consists of transportation-related records, photographs, and objects, but this year, MTM is establishing a new collections space. The Collections Intern will provide support for maintaining records and learning about acquisitions, the accessioning process, art and object handling procedures, storage care and maintenance, environmental care, and overall museum operations. The internship is for ten weeks this summer. For more information see the attached flyer and send in your information by Friday, March 16th. The Medieval and Renaissance Studies Program at Columbia University offers flexible opportunities to study the medieval and early modern worlds amidst the tremendous intellectual and cultural resources of New York City. Students are able to structure the degree to fit their interests, whether they specialize in one field or take an interdisciplinary approach. The program offers courses through a wide range of university departments, and students can choose to focus on any subject in the medieval and early modern eras in almost any geographical region (including Asia and the Americas). The degree is offered with both a full-time and a part-time option. Chris Dayton ’98, is a Cultural Resource Management Manager in Austen, TX working with an environmental firm. In his program, Dayton works with eight archeologists and five historians based in Texas, Oklahoma, and Louisiana. Any classics or history grads interested in CRM consulting (where 90% of US archaeology happens) or working in the Southwest, please ask pitman@macalester.edu for contact information. The Mount Vernon Hotel Museum and Garden is pleased to announce two William Randolph Hearst Fellowships for Summer 2018, for undergraduate or graduate students interested in American Studies, U.S. History, Museum Studies, or Education. The Hearst Fellows will conduct original research about NY history, work as interpreters, and assist with summer children’s programs. For more information, please look at this page on the Museum’s website and select “Fellowships” from the left hand menu. You can also find more details on the fellowship application. Macalester College Student Government (MCSG) recently started the GSAT Grant Program that assists students with graduate school admission test costs. This semester, they will be giving out 50 $100 grants to juniors and seniors appearing for any graduate school examinations. To apply, fill out the application by 11:59pm on February 12th. Columbia University’s M.A. in History and Literature (HiLi) is a unique, innovative program that explores the interconnections and intersections between history and literature as categories of cultural production and as scholarly disciplines. Throughout this one-year program, classes are taught by eminent professors from Columbia and supplemented with courses at École normale supérieure and École des hautes études en sciences sociales, two of France’s top-tier graduate schools. Students thus experience the best that American and French institutions of higher learning have to offer and hone their critical thinking. The program emphasizes academic rigor while encouraging students to pursue a wide variety of research interests for their M.A. essay. General Application Deadline: May 11. To learn more about the program and how to apply, see the Columbia and History and Literature Program Website. The ICPSR Summer Program’s four-week sessions are an immersive learning experience in which you’ll receive hands-on training in statistical models and quantitative methods while meeting and connecting with students, faculty, and researchers from around the world. All four-week courses are taught on the University of Michigan campus in Ann Arbor. Registration for all 2018 courses will open on Tuesday, February 6. To learn more about the programs and how to register, see the ICPSR Summer Programming Website. The Johns Hopkins University Center for Talented Youth (CTY) summer programs is looking for undergraduate students, graduate students, or instructors in your department who may be interested in summer employment as an etymologies teaching assistant or instructor. CTY offers challenging academic programs for highly talented elementary, middle, and high school students from across the country and around the world. Information regarding the CTY summer programs can be found at the CTY Website. The Chicago Journal of History, the University of Chicago’s undergraduate journal for research in history and related fields in the social sciences and humanities, is accepting submissions for the upcoming Spring 2018 edition. The Journal’s mission is to provide not only an opportunity for printed and online publication, but also a forum for dedicated undergraduate students of history and related fields from across the country to exchange ideas and share their intellectual passion. The Journal publishes biannually; each issue contains 5-7 original articles selected from a large pool of qualified submissions. All submissions are reviewed rigorously, and selected pieces undergo a collaborative editing process prior to publication. Papers must be submitted by February 4th, 2018, 12:00 PM CST in order to be considered for the Spring 2017 issue. To learn more about the journal and submission guidelines, see the Chicago Journal of History Website. Earn your work study off campus at the MN Historical Society. The Collections & History Day intern is a unique position that provides experience in doing historical research and helping 4-12th graders work on History Day projects. Spending time at the Minnesota History Center in the Collections Department is an invaluable experience for anyone who wants to work in the museum field. Student applications for Off-Campus Student Employment are due to the Civic Engagement Center on Monday, February 5, 2018. To learn more and apply, see the Macalester College Off Campus Student Employment Website. Columbia University is now accepting fall applications for the Fall 2018 M.A. program in European History, Politics, and Society. Housed within the European Institute, in this M.A. program students design their own programs of study. They can choose courses related to modern European topics in Arts and Sciences, the School of International and Public Affairs (SIPA), and the Law School. The program can be completed in 12 months but part-time study is also possible. The Deadline is is March 16, 2018. Visit the Columbia University European History, Politics and Society website to learn more. A Facebook group for posting library positions, mostly around Minnesota and Western Wisconsin is available to group members who join here. Macalester librarian Alexis Logsdon is an admin of the group, and says archives positions are often posted on the group page. The Minnesota Historical Society offers internships periodically. Information about those opportunities can be found here. (F) 01/02/2017 Fellowship with Angie Craig for Congress. Fellows of this campaign have gone on to be leading voices in local campaigns across the state or have been able to use the skills they learned to successfully move into the legislative or nonprofit side. We also are very committed to helping boost college students’ resumes and providing ample opportunities to develop skills essential for finding solid employment post-graduation. Attached is a flyer for our fellowship program. The David M. Rubenstein Rare Book & Manuscript Library is now accepting applications for our 2018-2019 research travel grants. Anyone who wishes to use materials from the designated collections for historical research is eligible to apply, regardless of academic status. Writers, creative and performing artists, film makers and journalists are welcome to apply for the research travel grants. Research Travel Grants support projects that present creative approaches, including historical research and documentation projects resulting in dissertations, publications, exhibitions, educational initiatives, documentary films, or other multimedia products and artistic works. The deadline for application is January 31, 2018 by 5:00 PM EST. Grants must be used between April 1, 2018 and June 30, 2019. To learn more about the grants and how to apply, visit the Duke University Travel Grant Website. 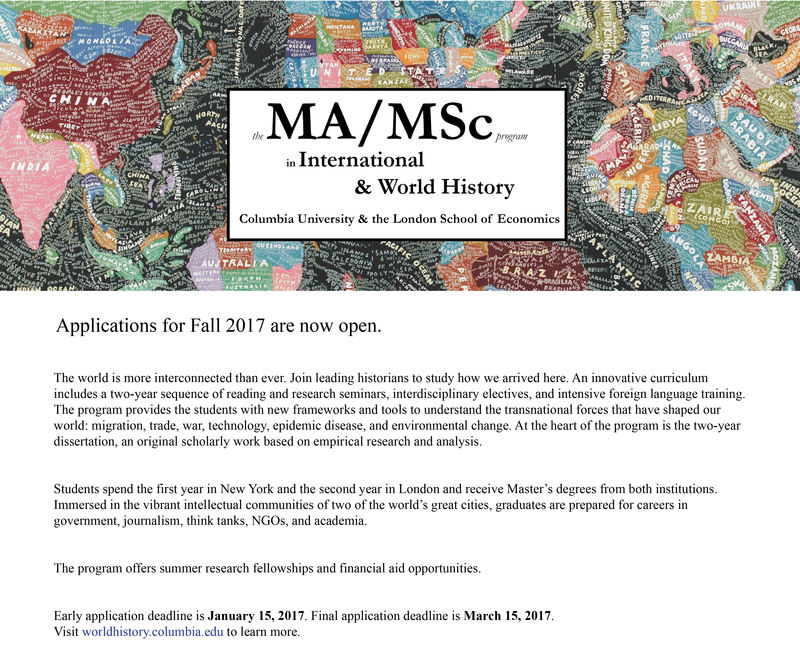 Columbia University and the London School of Economics is now accepting fall applications for the Fall 2018 dual MA/MSc program in International and World History. An innovative curriculum includes a two-year sequence of reading and research seminars, interdisciplinary electives, and intensive foreign language training. The Early Deadline is January 15, 2018 and the General Deadline is March 16, 2018. Visit the Columbia University World History Website to learn more. History Matters, the Appalachian State University’s Undergraduate Journal of Historical Research is accepting papers over the course of the fall and winter semesters. They will then publish selected papers in an online journal in May. The deadline for submissions is January 17, 2018. Visit the History Matters Website for more information and to access past issues. The Migration and Social Services Collections (MSSC) in the Archives & Special Collections comprises four collaborating collecting areas. This position works with the two busiest of these: primarily (75%) the Immigration History Research Center Archives (IHRCA) and secondarily (25%) the Social Welfare History Archives (SWHA) in a wide variety of functions including community engagement, research services, and fulfillment and retrieval services for the two units. S/he/they also broadly participates with and is a key member of MSSC. To learn more about required qualifications and how to apply, see the Archives Assistant Position Posting. The Washington University in St. Louis chapter of Phi Alpha Theta is delighted to announce a call for submissions to the Gateway History Journal, an academic journal of global history that seeks undergraduate papers of the highest caliber. They are looking for papers of 10-30 pages of length on any topic, region, or time period. Submissions are due by January 12, 2018. To find out more about submission guidelines, see the attached Gateway Call For Papers Flyer. A new campus job just posted for an Editorial Assistant, coordinating book reviews related to South Asian anthropology, political science, religion, literature and history. Anthropology Professor Arjun Guneratne is the Book Review Editor for the South Asia region for the Journal of Asian Studies. He is hiring for this position starting Spring semester 2018. Students in their sophomore or junior year are preferred for this position and should be able to commit to at least two (and preferably three) successive semesters of work. Clerical duties include corresponding with reviewers, keeping google sheets of data updated, tracking reviews, and mailing books. Research duties include identifying potential reviewers for books in the fields of South Asian anthropology, political science, religion, literature and history, and in consultation with the Editor, Professor Guneratne, selecting potential reviewers, and then securing their commitment to write the book review. If interested, please apply online through Student Employment. The successful candidate will be employed in the Anthropology department, and the position is paid as Level 2, $9.75 per hour. The international undergraduate philosophy journal at Cornell University, Logos, is now accepting submissions for its Spring 2018 publication. Papers will be evaluated for publication on the basis of a blind peer review, and cash prizes in the sums of $300, $150, and $50 will be awarded to the authors of the first, second, and third place papers respectively. Submissions are due January 1, 2018. For more information about the journal and submission guidelines, see the Logos Website. The 2018 Summer Seminars (June 10 – 16, 2018) are now open Advanced graduate students and faculty are eligible to apply. Applications are due December 15, 2017.ICSI offers advanced graduate students and faculty from around the world the opportunity to spend a week at the New School’s campus in Greenwich Village, working closely with some of the most distinguished thinkers shaping the course of contemporary social inquiry. To learn more about the seminars and to apply, see the ISCI Website. History Matters, Appalachian State University’s Undergraduate Journal of Historical Research, offers students who are interested in history the unique opportunity to be published while still completing their undergraduate degrees. Created by a history student who felt that he had no outlet to publish his research, History Matters is dedicated to recognizing top student work in all historic fields and familiarizing students with the publishing process. The deadline for submissions is January 17, 2018. For more information about the journal and submission guidelines,visit the History Matters Website. The peer-reviewed journal Quest: The History of Spaceflight is seeking student entries to its seventh annual Sacknoff Prize. Winners will receive $300, a trophy, be published in Quest, and be invited to present at the Society for the History of Technology (SHOT) Aerospace Special Interest Group (Albatross). Submissions are due by November 28, 2017. Quest welcomes papers on any topic related to space history – from the social effects of spaceflight to the financial and economic aspects of the space industry and much more. Learn more and apply at the Quest’s Sacknoff Website. The Masters in Heritage Studies and Public History (HSPH), a new professional program at the University of Minnesota that features a partnership with the Minnesota Historical Society. HSPH students explore the publicly engaged and community-accountable practices of historical scholarship, whether it is based in archival research, archaeology, material culture studies, architecture, preservation, or landscape studies. The HSPH program offers specialized tracks in Archaeological Heritage, Public History, and Historic Preservation. To learn more about the program and to apply, visit the HSPH Website. On November 2nd there will be a First Thursday event. Students and recent grads will participate in the panel. Here are the confirmed panelists​: Maggie Weber-History, Archives Internships​​, Sarah Kolenbrander- History, Museum Internships, Claire Grace- Creative Writing Submissions Manager, Intern at Entangled Publishing-YA and Adult Pubisher M.L. Kenney, English- Internships at National Endowment for Humanities & Breakthrough New York. To learn more see the First Thursday Flyer. Art History Department at St. Thomas and North Star Connect (Emerging Museum Professionals of the Twin Cities) are teaming up again this year for a museum networking night geared toward students at the undergraduate and graduate levels. Free networking with panelists from Mia, the Walker Art Center, Minnesota History Center, the Bakken, the American Museum of Asmat Art, and the Maplewood Historical Society. The event will take place November 9th at the Asmat Museum (University of St. Thomas) from 6-8pm. The Columbia Journal of Literary Criticism is seeking pitches and essays for its 2018 issue to be published in the spring. Writers should either be current undergraduates or recent graduates submitting undergraduate work. The forthcoming issue will explore the theme of ORGANS. We are looking forward to receiving pitches that explore ORGANS across its range of meanings and open up new possibilities. “We have been inventing new organs since the 15th century,” Paul Preciado writes. The organ invents the body as a system of parts, as an epistemic and physical disruption of the body’s unity, segmented along various axes: a gesture towards a material interior, the viscera, but also towards—encompassing the skin—its total divisibility, total partiality, and partial loss. To learn more about submission guidelines and see past issues, visit the CJLC Website. When considering where to apply to graduate school, consider applying to study Museum Studies at Kansas University. Museum studies is a growing multidisciplinary field that combines intellectual challenges with opportunities to share scholarly research with the public. It attracts students from all backgrounds who have interests spanning the humanities, natural sciences, arts, and social sciences. Museum Studies at KU is an affordable program designed to accommodate a wide range of student interests, strengths, and abilities. They work closely with each student to match their curiosity and talents with the needs and directions of the museum profession. To learn more about the program and how to apply, see the Museum Studies at KU Flyer. UJHS is a peer-reviewed academic journal that publishes student research in the humanities and social sciences, prioritizing perspectives that challenge, illuminate, and advance our understanding of the world we live in. Last issue marked our first expansion to include the work of St. Olaf and Macalester students, among other liberal arts colleges. The journal can be accessed online at the UJHS Main Website. And students can submit their work via the UJHS Submission Site. Special Events at the Smithsonian are currently accepting internship applications for spring 2018. To apply, please submit a cover letter, resume, letter of recommendation, and unofficial transcript to NMAHSpecialEvents@si.edu. Start and end dates and full time or part time availability should be included as well. The application deadline is Sunday, October 15, 2017. For more information about the internship and the application process, see the Special Events Internship Smithsonian Flyer. The Career Development Center is hosting Alumni Chats on campus. These are posted in Handshake for students to view and sign up to attend. Look at the Upcoming Alumni Chat Flyer to learn more about the chats happening in the next few weeks. 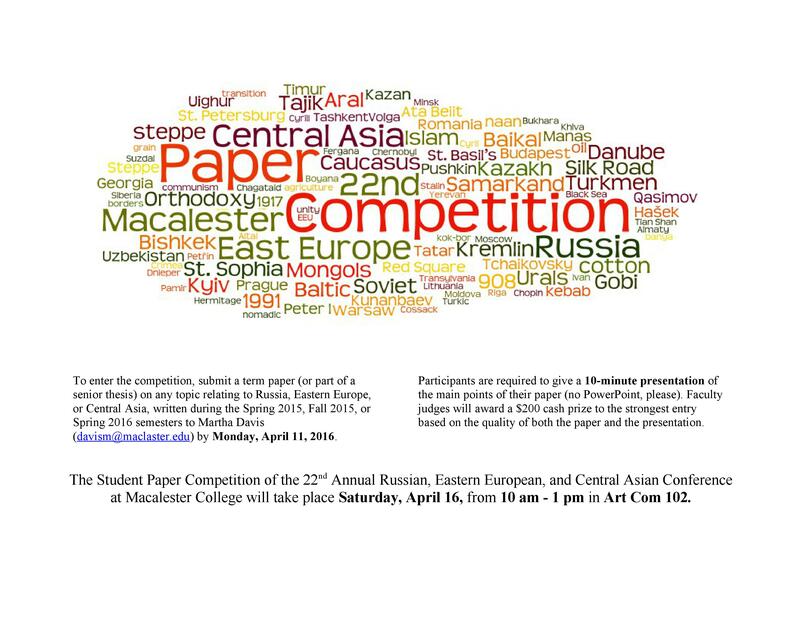 If you are interested in attending an event, please email Annie Doman at adoman@macalester.edu. A parent of a 10th grader is looking for a tutor on our campus 1 or 2 times a week (depending on your availability) for help with her AP History studies. Pay is negotiable, in the $25 to $35 range, depending on experience and skill. If you are interested contact Ayaan Barre at 612-388-0186. 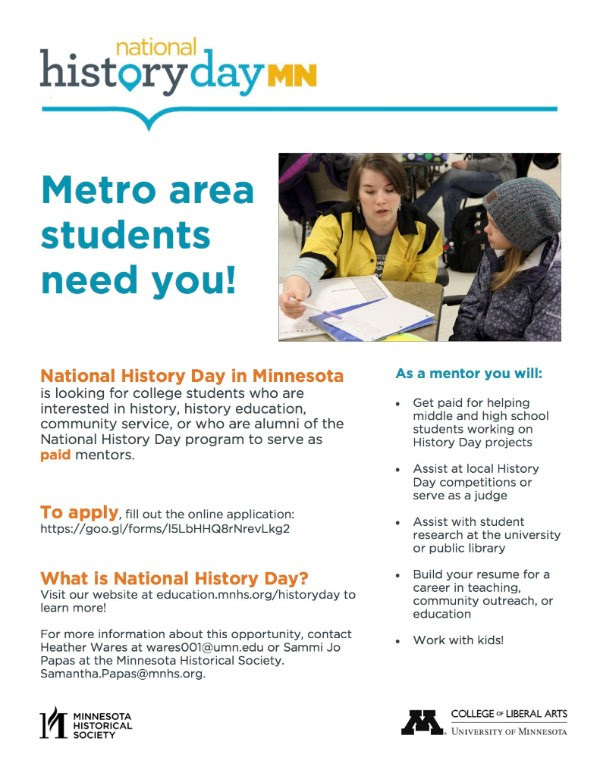 There are now positions available for mentoring students with the History Day Program with the Minnesota Historical Society. Students would aid metro area teachers in the delivery of History Day instruction and provide one on one support to middle and high school students. To apply, use the History Day Mentor Form. For more information see the History Day Website. Plan now to present your research at the 76th annual Midwest Political Science Association conference, April 5-8, 2018 at the Palmer House Hilton in Chicago, IL USA. Papers, roundtables, and complete panel proposals are due October 6, 2017. Visit the MPSA Conference Website to find out more and submit a proposal. The Jack, Joseph and Morton Mandel Center for Advanced Holocaust Studies at the United States Holocaust Memorial Museum invites applications for the international seminar “A Research Introduction to Jewish Life and the Holocaust in the Soviet Union.” This seminar will be held January 8-12, 2018, at the United States Holocaust Memorial Museum in Washington, DC. To apply, visit the Seminar’s Website. (I) Paid Summer Marketing Communication Internship at a large company in NYC. To learn more, see the internship posting here. Thursday, May 25, 2017 at 7:00 p.m. at Intermedia Arts, 2822 Lyndale Avenue South, Minneapolis, MN 55408 To learn more, visit the web page here. As a part of Asian Pacific American (APA) Heritage Month, keynote speaker Professor Juliana Hu Pegues, in a lecture titled “From Myth to Mutiny: Dispelling the Model Minority in our History and Activism,” examines the rich history of Asian American activism, nationally and locally, to show that Asian Americans have repeatedly confronted the idea and privilege of the “model minority.” Ultimately, we hope this talk fosters bridges gaps and cultivates a vibrant Asian communities on campus, as we work toward understanding and solidarity across diverse Asian identities and experiences. The talk will be on Tuesday, April 25th from 7-9pm in JBD. 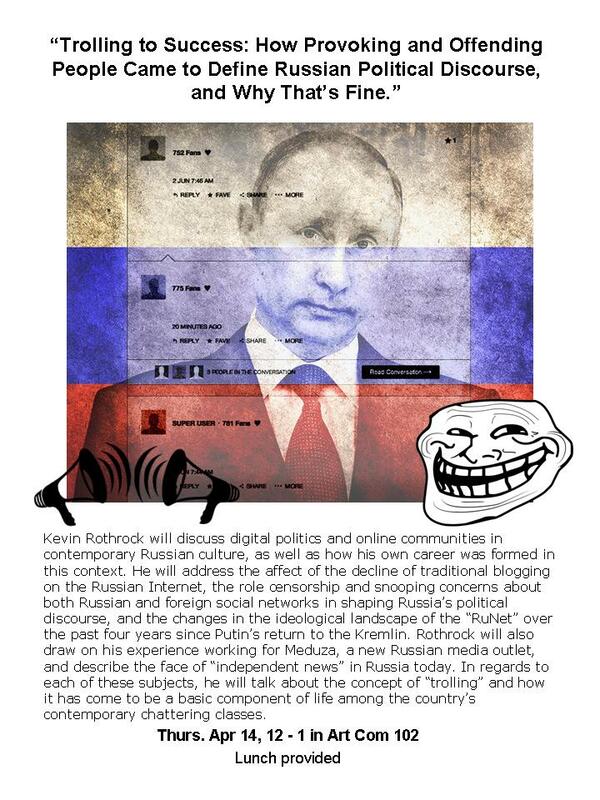 For more information, see the “From Myth to Mutiny” flyer. Macmillan Learning is currently offering a PAID internship opportunity for the Summer 2017. Interns will be provided with the opportunity to participate in work related assignments, gain practical work experience, and network with employees from various departments. Overall, the intern will become familiar with the basic structure of a publishing house and the role of each department within. To find out more about the intern position, see the ML History Editorial Intern Job Posting. The opening reception of The History of Asian Pacific American Activism at Macalester will be held from 4:45 to 6 p.m., Wednesday, April 19, in Campus Center 216. Refreshments will be served. As a part of Asian Pacific American (APA) Heritage Month, Macalester APIAC presents an archival history of Asian student activism on Macalester’s campus. To find out more about the event see the History of Asian Pacific American Activism at Macalester Event Flyer. The Office of Special Events at the Smithsonian’s National Museum of American History is currently accepting internship applications for fall 2017 for their Special Events Intern position. To apply, please submit a cover letter, resume, letter of recommendation, and unofficial transcript to the Special Events Email. Start and end dates and full time or part time availability should be included as well. The application deadline is Saturday, July 1st. To find put more about the internship, see the Smithsonian Special Events Intern Flyer. Talk, Standing Up to Tyranny: French Resistance During the Holocaust and its Message for Today. Nelly Trocmé Hewett, Pastor Trocmé’s daughter, who was a teenager in Le Chambon during the war, will talk about this resistance and its message to stand up for refugees and other marginalized people today at a program on Friday, May 12 at St. Paul City Hall, Room 40, Lower Level, 15 West Kellogg Boulevard, St. Paul, from noon-2:00 pm. The event is free and open to the public. For more information, see the WWG Holocaust Commemoration Event Flyer. The University of Chicago is pioneering a new MA program, with significant resources and merit scholarships. Computational Social Science is an emergent approach in which students apply the latest innovations in computer science and statistics to complex social questions. Working with very big data, on a scale that far exceeds earlier research, computational researchers are devising innovative formal, statistical, and computational models to make important contributions across the social sciences. The deadline is April 30th. To learn more about the program and find a link to apply, see the UChicago Computational Social Science Website. The Global Engagement Studies Institute (GESI) at Northwestern University is offering placements in international internships with community-based organizations in Africa, Latin America, and India for summer and fall 2017. The deadline for summer is March 1st, but applications are reviewed until sites fill. The deadline for the fall program is April 1st. For more information and to apply, please see the GESI website. American Girl in Madison, WI is looking for a researcher to ensure the accuracy and authenticity of American Girl characters. Qualifications include a Bachelor’s degree and research experience. For more information, see the job posting. The City of Hugo in Minnesota is looking for an undergraduate student to work as the Historical Commission Intern. This internship will be paid. Application deadline is April 14, 2017. For more information, see the City of Hugo History Intern Flyer. Marisol de la Cadena will speak at the 2nd annual David W. McCurdy Distinguished Anthropology Lecture. The title of her lecture is “Uncommoning Nature.” The lecture will be held on Thursday, March 23 at 4:45pm in JBD Lecture Hall, with reception following in Weyerhaeuser Board Room. For more information, see the Uncommoning Nature flyer. The Minnesota Historical Society is now accepting application submissions to the Inclusion and Community Engagement Fellows Program (INCE). INCE encourages undergraduate students in the Twin Cities from diverse communities to explore the challenges within museums, historical organizations, and cultural institutions related to inclusion, representation, narrative, and the workforce. The priority application deadline is March 24, 2017. See the attached MNHS Fellowship Flyer for more information and a link to the application. The Europa Club will be hosting an event involving the screening of “The Fog of Srebrenica”, a short documentary on the consequences of the Bosnian genocide from the breakup of Yugoslavia. The event will take place this coming Wednesday on the 1st of March (Bosnia and Herzegovina’s Independence Day) in Weyerhaeuser from 5pm to 7pm. Following the documentary, the participants will be invited to take part in an informal discussion while enjoying gyros, spanakorizo and Balkan music. This graduate program is a new partnership between the University of Minnesota and the Minnesota Historical Society. It provides heritage and public history professionals with a broad disciplinary perspective, increasing their resource base and network of expertise. Students take advantage of the deep scholarly expertise in these fields at the University of Minnesota, as well as the Minnesota Historical Society’s extensive resources and expertise, to offer unparalleled training in the theory and methods of heritage and public history studies at the graduate level. For more information about the program and how to apply, see the Heritage Studies and Public History Website. World Without Genocide will host a talk about the role of the International Criminal Court in protecting cultures and prosecuting perpetrators of genocide, war crimes, and crimes against humanity. This program will be held on Wednesday, March 22 at Mitchell Hamline School of Law. For more information about the talk see the Preventing Cultural Genocide Talk Flyer. The Minnesota Historical Society’s Department for Diversity and Inclusion holds the American Indian Museum Fellowship (AIMF). AIMF is designed to educate American Indian undergraduates about professional opportunities within the museum fields and encourages undergraduates from diverse communities to explore the challenges within museums, historical organizations, and cultural institutions related to inclusion, representation, narrative, and the workforce. See more information in the American Indian Museum Fellowship Flyer. MacNest is a summer internship program where students receive funding for unpaid internships with Twin Cities startups. Participants will also live in a community with other MacNest student interns in the Summit House (housing is provided). MacNest student interns will receive grants of $4,500 for full-time, unpaid internships with the expectation they will work 35-40 hours a week over a ten week period. The program runs from Tuesday, May 30 – Friday, August 4th. Application deadline is March 20th at 11:59. To find out more, see the MAC Nest Flyer. An open house celebrating African American literature and authors, at the Givens Collection of African American Literature in the University of Minnesota’s Elmer L. Anderson Library on Sunday, February 19, 2:00-4:00pm. See the full notice here. The West Point Undergraduate Historical Review is inviting all undergraduate students to submit their historical papers United States Military Academy’s historical journal. Deadline to submit is April 7, 2017. To find out more see the USMA Journal Call for Papers Flyer. The Lectures Coordination Board of MCSG is excited to announce the 2017 spring speaker event: Nikki Giovannion Thursday, February 23, 2017 from at 7:00 pm in the Kagin Ballroom. Nikki Giovanni is a world-renowned poet, writer, commentator, activist, and educator. Over the past 30 years, her outspokenness, in her writing and lectures, has brought the eyes of the world upon her. One of the most widely-read American poets, she prides herself on being “Black American, a daughter, a mother, a professor of English.” Tickets are free with a Macalester ID beginning February 6, 2017 at the Information Desk in the Campus Center. For more info, see the Nikki Giovanni Lecture Flyer. 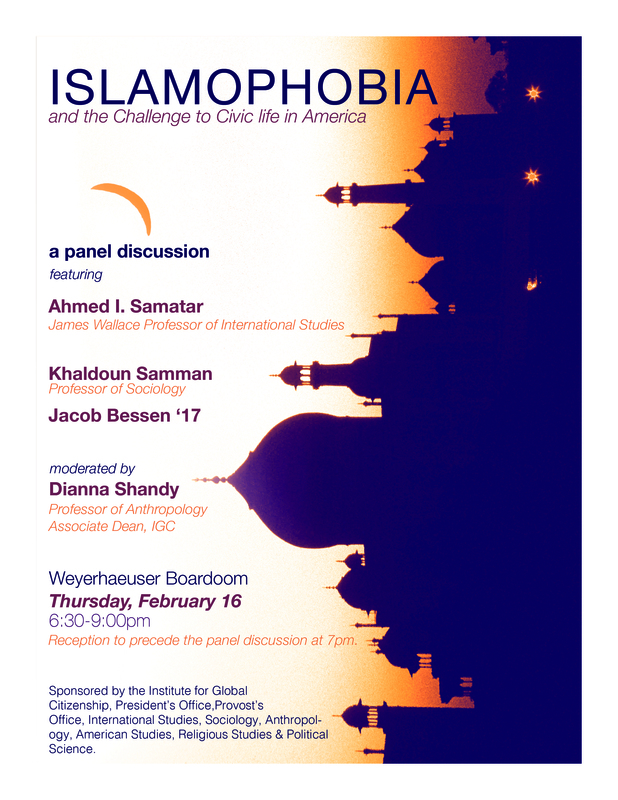 The Islamophobia and the Challenge to Civic Life in America panel discussion will take place on Thurs, Feb 16, 6:30-9:00 pm in Weyerhaeuser Boardroom. The reception will begin at 6:30 pm. Panelist remarks by Prof. Samman, Prof. Samatar, and Jacob Bessen (Religious Studies and International Studies) ’17 will begin at 7 pm. Discussion to follow. For more information about the event, see the Islamophobia Event Flyer. AEI’s Summer Honors Program is a fully funded educational and career development opportunity for undergraduate students interested in public policy and politics. Each year, they bring together top students from around the country to discuss policy topics in small seminars, join daily lunches with policymakers and business leaders, and advance their careers through high-level networking opportunities. The program gives students an unparalleled opportunity to spend one week immersing themselves in a particular public policy issue with leading scholars and practitioners in their fields. Instructors this year include AEI scholars Charles Murray, Fred Kagan, John Yoo and Michael Strain teaching about everything from democratic capitalism, to the Constitution, to the Middle East, and more. More information and the application can be found at the AEI Summer Honors Program Website. The application deadline is March 15, 2017. The Black History Month (BHM) Committee has been hard at work planning events for Black History Month 2017 at Macalester. To find out about all the events, see the Black History Month Calendar. The Mount Vernon Hotel Museum and Garden is pleased to announce two William Randolph Hearst Fellowships for Summer 2017, for undergraduate or graduate students interested in American Studies, U.S. History, Museum Studies, or Education. The Hearst Fellows will conduct original research about NY history, work as interpreters, and assist with summer children’s programs. For more information, see the William Hearst Fellowship Flyer. The American Swedish Institute is hosting a series of informational meetings for prospective volunteers from February through April. For more information see the ASI Volunteer Flyer. The U of M Library is hosting an open house celebrating African American literature and authors at the Givens Collection of African American Literature on Sunday, February 19 from 2:00 to 4:00 p.m., with brief remarks at 2:30 p.m.The location will be the Givens Suite, 120 Elmer L. Andersen Library University of Minnesota, 222 21st Ave. S., Minneapolis, MN To register visit the Givens Collection Registration Link. Smiths Island Archaeology Field School will be training students in excavation and research methods and prepared them for graduate study in the Bermuda Archives, tours of local sites and even an experimental archeology practicum. Students will learn about Bermuda’s extensive history, ethnogenesis, and the process of Americanization. To apply or find out more, see the Smith Island Field School Flyer. The University of St. Thomas is now offering a new Graduate Certificate in Museum Studies, available through the Department of Art History The goal of the Certificate is to provide students with opportunities to establish or retool their skill sets in order to gain the competitive edge when entering museum/non-profit careers, broadly defined. The Certificate can be completed individually or jointly with our MA program in Art History. To find out more visit the St. Thomas Museum Studies Graduate Certificate Website. Columbia’s M.A. program in Modern European Studies is now accepting applications for the 2017-2018 academic year. Application deadline is Jan. 17, 2017 for early admission, March 15, 2017 for regular admission. 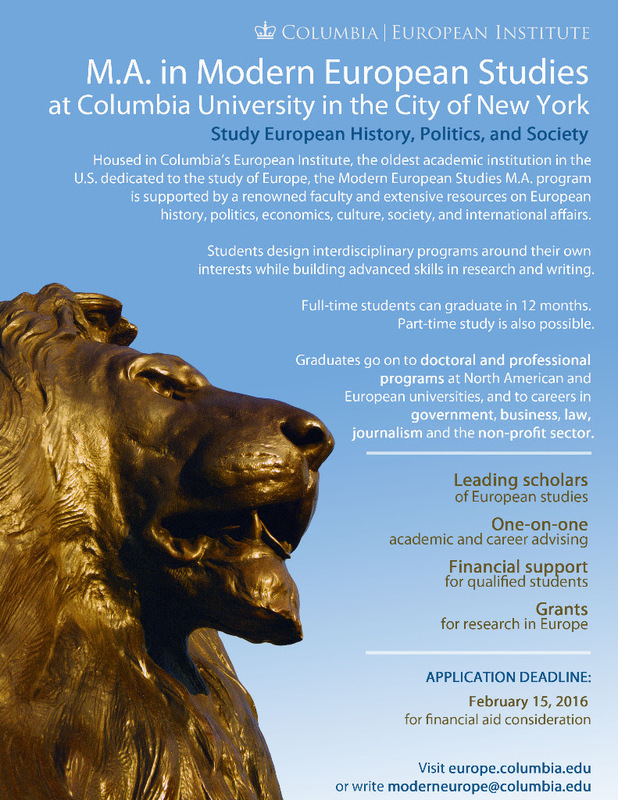 To find out more about the program, see the Columbia MA Modern European Studies Flyer. The Chicago Journal of History, the University of Chicago’s undergraduate journal for research in history and the social sciences, is accepting submissions for the upcoming Spring 2017 Edition. Open to young scholars from top research universities in both the United States and the international community, the Chicago Journal of History is publishing its Spring Edition of the 2016-2017 academic year. Papers should be submitted to the Chicago Journal of History Email as an MS Word or PDF attachment (document title: “Last name + paper title”) by Friday February 15th, 2016. Please be sure to format citations in the Chicago style and include a works cited page. The Edina Historical Society is seeking two contract Curatorial Assistants to do an inventory of our permanent collection which consists of approximately 15,000 artifacts. This is a great opportunity for recent graduates and Graduate students. The positions are contract based for one year. For more information about the duties of the jobs and how to apply, see the Edina Historical Society Job Description Flyer. The Tufts Historical Review is an academic journal of global history that seeks both undergraduate and graduate papers of the highest caliber. This year, the journal will be centered around the theme of Legends. Submissions are due by 31 January 2017. For more information see the Tufts Historical Review Submissions Guidelines Flyer. Housed within the Asian Institute at the Munk School of Global Affairs in Canada’s premier research university, the Collaborative Master’s Program in Asia-Pacific Studies (MAPS) provides an interdisciplinary scholarly approach to the region and facilitates learning and intellectual exchange within a small group setting. Students are provided with advanced training in traditional disciplines as well as interdisciplinary expertise in historical and social science studies, laying the groundwork for doctoral study or global careers in government, business, or NGOs. Apply by February 1 for the September 2017 program. To find out more about the program and how to apply visit the MA in Asia-Pacific at U of Toronto Website. Founded in 2002, CJLC acts as an interdisciplinary forum centered around literature, culture, and politics. The journal is published once a year and includes articles, reviews, interviews, and original artwork.The forthcoming issue will explore the theme of CONSUMPTION. To find out more about how to submit pieces or look at previous publications, see the CJLC Website. Gateway History Journal, an academic journal of global history that seeks undergraduate papers of the highest caliber would like to invite all students in the history program to submit essays. They are looking for papers of 10-30 pages of length on any topic, region, or time period. Submissions are due by 13 January 2017. For more information about submissions see the Gateway CFP Flyer. Chinese Music Concert to be held on Saturday, November 12. Chinese Music Ensemble at Macalester, which consists of 8 to10 active student members. Yue-Him of the History Department serves as faculty advisor to this group. The concert is at 1 pm, Saturday, Nov. 12 in the Chapel. For more information see the Chinese Music Concert Flyer. At the University of Kansas, Museum Studies is a rigorous academic discipline that prepares students to become leaders in this rapidly changing field. Students have opportunities to gain real-world experience in our highly regarded on-campus museums. Museum Studies at KU is an affordable program designed to draw upon a wide range of student interests and abilities. Find out more about the program in the KU Museum Studies Program Flyer. World Without Genocide will host a talk by Scott Straus, Ph.D., internationally-known genocide prevention expert, on Tuesday, December 6, from 7:00-9:00 pm at Mitchell Hamline School of Law, St. Paul. For information about the speakers and tickets see the WWG Prevention Talk Flier. Macalester College offers sophomore/junior/senior students the opportunity to explore careers and connections with alumni in select cities via the MacConnect Program. Trips are made possible through collaboration of Macalester Career Development Center (CDC), Alumni Relations, and Advancement Offices. Students from all majors and disciplines are encouraged to apply. This trip benefits Macalester as it offers a collaborative opportunity for alumni to share their expertise with current students, and students to serve as ambassadors of the College. Applications are now open. Deadline to apply for either trip is November 11, 4:30 pm. For more information about the San Francisco trip see the SF MacConnect Flyer and for more information about the DC trip, see the DC MacConnect Flyer. Columbia University is now opening its applications for its Oral History MA Program as well as corresponding fellowships and scholarships. Applications for Fall 2017 will be reviewed on a rolling basis starting on November 15, 2016 through June 1, 2017. The priority deadline is March 1, 2017. For more information, see the Columbia University Oral History Website. The Washington and Minneapolis offices of Senator Amy Klobuchar are currently accepting internship applications for the 2017 spring session. An internship with the Senator’s office is a terrific chance for students to gain first-hand experience with both the legislative process and constituent services in the United States Senate. For more information about the internship, visit Senator Klobuchar’s Internship Website. The Museum of Russian Art are having a Call for Participants for the Interdisciplinary Student Research Symposium. This will take place at the Museum of Russian Art in February 2017. The symposium will center around research that is connected to Russian culture broadly defined. Students who would like to find out more can see the MRA Symposium Flyer and e-mail the coordinator at at chadaga@macalester.edu. There will be an on-campus informational session on Wednesday, November 2 at 5:00 p.m. (in Campus Center Room 215) with informational interviews on November 3 (in the Career Center). Carney, Sandoe & Associates is an educational recruitment firm that places teachers and administrators in private, independent, and like-kind (charter, magnet, pilot and merit) schools across the nation and internationally.If students would like to apply for an interview, they should attend the info session. The Minnesota Historical Society has recently posted many relevant internships! The deadline for upcoming spring internships is October 31. All the internship postings can be found at the Minnesota Historical Society Internship Website. Earn a MA degree in International and World History at Columbia University and the London School of Economics after graduating Macalester! For more information about applying and the program itself see the MA Program at Columbia and LSE Flyer. UJHS is a peer-reviewed academic journal that publishes student research in the humanities and social sciences. In past issues, they’ve published works that tackle topics from the student loan market for Muslim-Americans to orientalism in Curious George, tiny homes, and the racialization of poverty. They are now looking to expand the journal to include the work of Macalester students. To learn more and submit papers see the UJHS Website. The Immigration History Research Center (IHRC) at the University of Minnesota, Twin Cities, is hosting a special keynote talk by Professor Emeritus Albert Camarillo (History, Stanford University). Professor Camarillo is an expert on Chicano and Mexican American history. He is coming to the Minneapolis to discuss his current research on American urban history that compares the experiences of European and Asian immigrants, African Americans, and Mexican Americans from 1850-1950. This event will be held on Thursday, October 27, 2016 at 6PM in the Elmer L Andersen Library on the UMN West Bank campus. See the IHRC Talk Flyer for more information. Humphrey School of Public Affairs Junior Summer Institute (JSI) at the University of Minnesota is a fully-funded, seven-week academic and experiential learning program open to U.S. students who are entering their senior year of undergraduate study. It is part of the national Public Policy and International Affairs (PPIA) Fellowship Program, which is committed to promoting the inclusion of underrepresented groups in master’s degree programs and careers in public service. Applications are due November 1st. Learn more and apply at the PPIA Junior Summer Institute Website. The Horizons Fellowship supports 10 outstanding university students in their pursuit to become leaders in technology. The program provides immersive software engineering and web/mobile development courses geared towards high-achieving college students. No computer science background needed and we invite liberal arts students to apply! Our curriculum, developed by ex-Salesforce, Optimizely, and D.E. Shaw engineers, is designed to teach students how to build web, mobile (iOS and Android) and desktop applications. We have a 4-month spring program and a 3-month summer program in San Francisco, Boston, and Philadelphia. To apply and find out more see The Horizons Fellowship Website. World Without Genocide is hosting an event on Tuesday, November 1 at the Mitchell Hamline School of Law, about the genocide of the Herero and the Holocaust. Wake Forest University in Winston-Salem, North Carolina is now offering a one-year program that offers both a master’s degree as well as teacher licensure. For more information see the Department Chair Description of the Program as well as the WFU MA in Education Flyer. There will be a speed networking event with a panel of established museum professionals coming up at the University of St. Thomas the evening of October 27th. This event will be free and geared toward students. Event will start at 6 PM and be located in the Anderson Student Center: 2115 Summit Avenue, Saint Paul, MN 55105. Curator an editor of Streetopia will be giving a talk at Macalester on Thursday, October 13 at 5:00 – 6:30pm in Neill 401. Applications for Fall 2017 are being accepted and reviewed on a rolling basis. Tuition scholarships will also be offered to candidates accepted to the MA program. It is recommended to apply as soon as possible, as funds are limited.In addition to courses offered by the CEMS Department, graduate students may take classes with a European/Mediterranean focus offered by other departments—including, but not limited to, history, politics, anthropology, cinema studies, French studies, Italian studies, Irish studies, and many other disciplines. Students may also take courses at other NYU schools—such as the School of Law or Graduate School of Public Service—as well as at Columbia University, through a special Consortium agreement existing between the two institutions. 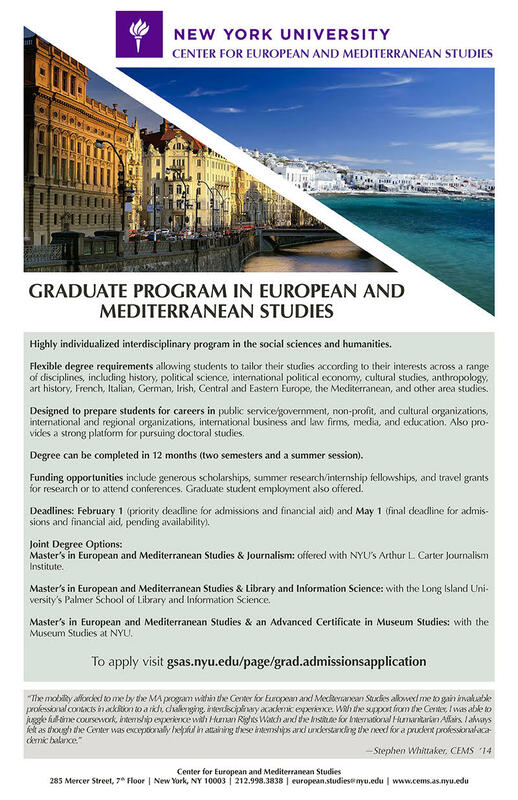 For more information like how to apply, see the MA in European and Mediterranean Studies NYU Flyer. Professor Karin Velez will be presenting at the University of Minnesota’s Honors Lecture Series, “Six Women, Six Topics, Six Perspectives” on Monday, September 26, at 7 pm, in the Ted Mann Concert Hall (West Bank). Her talk will be “Well-Behaved Women (and Animals) Seldom Make History: Questioning Behavior Standards in the History of Religion.” Tickets are $7 for non-UMN students, but come talk to Herta in the History Department for help with tickets. For the full lineup at the series, the the Honors Lecture Series Flyer. The Journal is currently accepting submissions for its Fall 2016 issue. It seeks to publish the world’s premier undergraduate work related to international themes. Submissions generally range in length from 5 to 20 pages, but may be longer. Submissions must not have been published in any other publication. Current undergraduates and recent graduates (one semester out or less) are eligible to submit their work. To submit your work, email it as an attachment to juis@global.wisc.edu. Submissions must be received by Sunday October 9th, 2016 at 11:59 pm CST. The Archaeological Institute of America offers a range of funding opportunities, including fellowships, publication grants, scholarships and travel grants—plus the Site Preservation grants and awards, and the Cotsen Excavation Grants. Further information can be found on the AIA’s website at http://www.archaeological.org/grants. Fall deadlines coming up for many of the programs. See their fellowship flier here. And see their grant flier here. This project is for an enterprising person with a passion for African American history and audio storytelling. APM Reports and The Washington Post are partnering to create a signature new podcast and related web materials to mark the opening of the Smithsonian Institution’s National Museum of African American History and Culture. This fellowship position will assist with the production of the podcast and related media. More information here. The Edina Historical Society has opportunities for college students and recent grads looking to gain hands on experience in the museum field. Hours are flexible and can be completed for school credit. Positions are unpaid. See the Internship announcement here. (C) 5/5/2016 Chicago Journal of History, the University of Chicago’s undergraduate journal for historical research, is accepting submissions for the upcoming Autumn 2016 Edition. There are no particular thematic restrictions. Most successful submissions range from 15 to 30 pages. Papers written for lectures and seminars, works produced in independent research, as well as B.A. theses are welcomed. Papers should be submitted to ughistoryjournal@gmail.com as an MS Word or PDF attachment (document title: “Last name + paper title”) by Friday September 9th, 2016. Please be sure to format citations in the Chicago style and include a works cited page. For more information about the journal and to read our previous issues, please visit the website cjh.uchicago.edu. 18 positions!!!! FT/Paid, with placement in nonprofits many supporting ethnic and community building nonprofits. Search MN Council for Nonprofits on MC2. Crossing Borders Activists in collaboration with Amnesty International Student Organization is holding a panel discussion highlighting “Policy Implications of the refugee crisis in Europe and the U.S.” Join in for a rich discussion, learning, and sharing knowledge with professors, researchers and community members. The program includes a panel of expert who will discuss various topics on the refugee experience and the legal aspects relating to their journey and challenges in seeking asylum. See the Crossing Borders Flyer for more information. 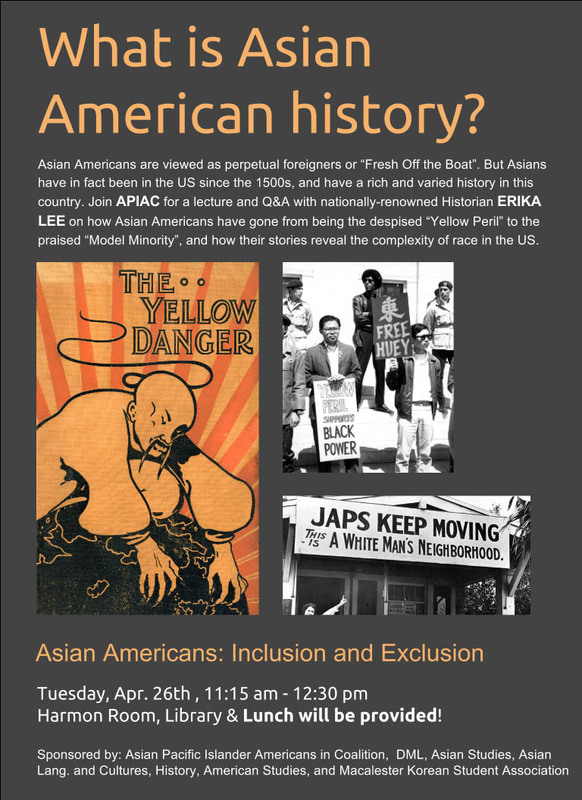 Join APIAC for a lecture and Q&A with nationally-renowned Historian Erika Lee on how Asian Americans have gone from being the despised “Yellow Peril” to the praised “Model Minority,” and how their stories reveal the complexity of race in the US. Co-sponsored by History. Light lunch will be provided. See the poster here. West Academic is offering paid internship opportunities in our publishing group starting immediately through the end of Summer. Applications are due May 17th. For more information see the WAP Summer Intern Flier. The Hennepin Medical History Center is seeking a self­directed, motivated, organized, and hardworking individual who can assist the organization in its work this summer. Applications due May 1st. See the HMHC History Collections Intern Flier. The Macalester Internship Office has recently shared these opportunities:National Park Service Museum Aide Intern: Paid internship in West Virginia. Applications due April 14th. See NPS Museum Intern Flier for more details on how to apply. Exhibit Development Group Project Management Intern: Starts June 1st in St. Paul. Applications due May 15th. See EDP Project Management Intern Flier for more information. User Assistance / Technical Writing Summer Intern- May- August 2016, See UATW Summer Intern Flier for more information. On Wednesday, April 27 from 5:00 -7:00/8:30, in the Weyerhaeuser Boardroom the Fourth Critical Theory Annual Symposium will be taking place. The topic this year is Orientalism, Postcolonialism, Globalization, and our three speakers are widely esteemed scholars and Macalester cherished teachers and colleagues: David Blaney (Political Science), Julia Chadaga (Russian Studies), and Khaldoun Samman (Sociology). See the CT Annual Symposium Flier for more details. The Department of Art & Art History is sponsoring an event that will bring Somali elders to campus to teach loomless weaving. See the flyer here. The “ACTC Museum Fellows Program” is designed to engage students in studying the challenges related to the underrepresentation of communities of color and American Indian Nations in historical organizations, museums, and public history graduate programs. View the ACTC Fellows Program flier here. There is an on going China Talk Series sponsored by the US-China Peoples Friendship Association-MN Chapter (USCPFA-MN) and co-sponsored by our History Department and the student organization The Chinese Culture Club (CCC) to be held several times per year on our campus. The mission of the Series is to introduce Chinese culture to the main stream society in the U.S. and to promote friendship and understanding between the peoples of China and the United States. World Without Genocide will host a talk, Guatemala: Prosecuting Genocide, Rebuilding Communities, on Thursday, March 31, at Mitchell Hamline School of Law from 7:00 – 9:00 pm. This program will examine the 36 years of armed conflict in Guatemala and transitional justice for rural Mayan communities. The ICPSR Summer Program offers rigorous, hands-on training in a wide range of methodologies and techniques for research across the social, behavioral, and medical sciences. In Ann Arbor, Michigan, the Summer Program’s four-week sessions. The first session is from June 20-July 15 and the second from July 18-Aug. 12. Applications are due April 30. For info about courses, fees, scholarships, and registration, visit icpsr.umich.edu/sumprog or contact sumprog@icpsr.umich.edu. Tuesday, March 1, 2016 from 11:30 am – 1:00 pm in Smail Gallery of Olin Rice recruiters from the following places will be on campus: Metropolitan Council, US Army & Army Reserve, U.S. Fish and Wildlife Service,Elite Medical Scribes, Emergency Care Consultants – Emergency Scribes, SciTechsperience Internship Program & Job Board, Pioneer Project Services, Peace Corps, Fraser, Epic, Mayo Clinic, and Boston Scientific. Please dress in business casual. The Department of Inclusion and Community Engagement at the Minnesota Historical Society is recruiting possible candidates for the American Indian Museum Fellowship from June 2nd – June 19th 2016. Priority deadline for application materials is due by March 19th and all applications materials must be in no later than March 26. For more information, see the flier concerning the American Indian Museum Fellowship Opportunity. EdénTorres, Chair of the Department of Chicano and Latino Studies and Associate Professor in the Departments of Gender, Women and Sexuality Studies, University of Minnesota will be visiting Monday, Feb. 22 at 4:45 p.m. in Olin Rice 250 to give a talk on how history of racism towards U.S. Chican@s and Latin@s has lead to contemporary structural inequalities. For more information, see the Edén Torres Talk Flier. Macalester Consulting Group meets weekly to solve fun problems, and helps you get consulting jobs, in which you meet problems, and solve them. If you have a curious mind, if you love to solve fun problems, they welcome you. They also welcome you to sign up for Case Competition#2, 7:00 p.m.-9:30 p.m. Tuesday, 16th Feb. See the flier here. Apply here. Six applicants will be accepted. If you are not selected for Case Competition#2, you are invited to participate in our case competition from 8:00 p.m. to 9:00 p.m. on 23rd Feb. The deadline to sign up is 11:59 p.m. on 12th Feb.
Thursday, February 18th in Davis Court, Markim Hall from 11:30 AM – 1:00 PM, an exciting Global Citizenship in the News panel will explicate the differences and functions of caucuses, primaries, and evaluate the complex ways these “democratic” institutions affect the US’ government and citizenry. See flier here. MassMoCA Internship Summer 2016. Deadline March 7th See flier here. Leadership and the American Presidency Internship Program Summer 2016 Deadline June 1 See flier here. NYU’s Center for European and Mediterranean Studies is now accepting applications for the 2016-2017 academic year with degree options such as: M.A. in European and Mediterranean Studies & Journalism, M.A. in European and Mediterranean Studies & Library and Information Science, and M.A. in European and Mediterranean Studies & an Advanced Certificate in Museum Studies. See more here. March 9, this program will examine the FBI’s jurisdiction and role in bringing perpetrators on Indian reservations to justice and the challenges facing Indian victims of sexual violence. The Mount Vernon Hotel Museum and Garden has announced two William Randolph Hearst Fellowships for Summer 2016. Deadline to apply is March 4, 2016. See more here. Shelburne Museum Education Program Intern: Summer 2016 June 13- August 12 See flier here. Report, the West Point Undergraduate Historical Review, is accepting paper submissions by February 19 at WestPointREPORT@gmail.com. See posting here. International Business Development Internship ­ Summer/Fall 2016. See the posting here. Museum Studies Internship ­ Summer/Fall 2016. See the posting here. New Sector Alliance Fellowship applications are due February 1, 2016. See the posting here. The Macalester Internship Office has posted this internship with the Bipartisan Policy Center. Syracuse University offers a fifteen-month “Documentary Film and History” program MA degree for History majors and minors. The program is designed for students interested in making documentary films on historical themes, offering an opportunity to deepen their understanding of history while they acquire the practical skills of the filmmaker’s craft. In addition to taking courses on film production, screenwriting, and historical methods, students choose courses that allow them to deepen their knowledge of a specific field within history. For more information on the program, visit: http://newhouse.syr.edu/academics/degrees/masters/documentary-film-and-history. The Chicago Journal of History, an undergraduate historical review at the University of Chicago, is welcoming submissions for its Spring 2016 edition. Papers selected for the Spring 2016 edition of the Journal will be published in March of 2016. Most successful submissions range from 15 to 25 pages, although this does not represent so much a strict requirement as a suggestion to applicants. Please be sure to format citations in the Chicago style and include a works cited page. Papers should be submitted to ughistoryjournal@gmail.com as an MS Word or PDF attachment (document title: “Last name+paper title”) by January 25th, 2016. For more information about the journal and to read previous issues, please visit cjh.uchicago.edu. A historical research project will be conducted in the summer of 2016, exploring the history of ESFL’s Carnegie Library building (on the National Historic Sites and the St. Paul Heritage Preservation lists) in anticipation of its centennial in 2017. This research will include engaging secondary sources in the history of the Carnegie Steel Company and Andrew Carnegie, its labor practices, American philanthropy, and the places of libraries in American culture, as well as digging into local primary sources, such as newspapers, city government and public library system records, the papers of the architect, manuscript census of population and city directories, and the undertaking of oral history interviews with neighborhood residents. This research will be conducted under the direction of ESFL co-executive director and Macalester History Professor Emeritus Peter Rachleff. Interested students should contact Peter Rachleff, at rachleff@macalester.edu. Museum studies is a multidisciplinary field that combines intellectual challenges with opportunities to bring the insights of scholars to diverse public audiences. 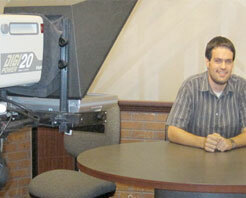 The University of Kansas offers a museum studies master’s degree program. To learn more see their flyer here. The Washington University in St. Louis’s chapter of Phi Alpha Theta announces a call for submissions to the Gateway History Journal, an academic journal of global history that seeks undergraduate papers of the highest caliber. They are looking for papers of 10-30 pages of length on any topic, region, or time period. Submissions are due by 8 January 2016 and should be submitted to pat.wustl@gmail.com. Please refer to this document for more information. If you have any questions, contact Jacqueline Blickman at jblickman@wustl.edu. Center for School Change announcement can be found here. Minnesota Coalition for Battered Women announcement can be found here. 10 week course that meets twice a week in the evenings from end of May/beginning of June through August, taught by a Kaplan instructor, at the Minnesota Law campus in Minneapolis. The course also includes helpful info sessions and the opportunity to meet with the Minnesota Law Admissions department, Career Services, and current students & alumni. The course is free to participants but does require a $100 seat deposit (fully refundable if the participant successfully completes the course). World Without Genocide, a nonprofit in Saint Paul, has an opening for a social media and graphic design intern. View The Position Description Here. The Mellon-CES Dissertation Completion Fellowship is funded by the Andrew W. Mellon Foundation and includes a $25,000 stipend, as well as assistance in securing reimbursements or waivers in eligible health insurance and candidacy fees. Mellon-CES Dissertation Completion Fellowships are intended to facilitate the timely completion of the doctoral degree by late-stage graduate students focusing on topics in European Studies in the humanities. Applications are due (along with all supporting materials) on or before January 26, 2016. For more information, click here. The Pre-Dissertation Research Fellowship includes a $4,000 stipend, the opportunity to publish in Perspectives on Europe, a semi-annual journal of the Council for European Studies, and other professional development activities. CES Pre-Dissertation Fellowships fund two months’ travel to Europe to conduct the exploratory phase of a projected dissertation project in the social sciences or humanities which will require a subsequent stay in Europe. Applications are due (along with all supporting materials) on or before January 16, 2016. The Metropolitan Council is looking for students to participate their Urban Scholars Program. The program is a 13-week PAID summer internship and leadership development program for low income, students with disabilities, and/or students of color. The program will provide college students with a distinctive professional experience focused on gaining essential leadership skills, and creating career pathways to positions of influence in public service. 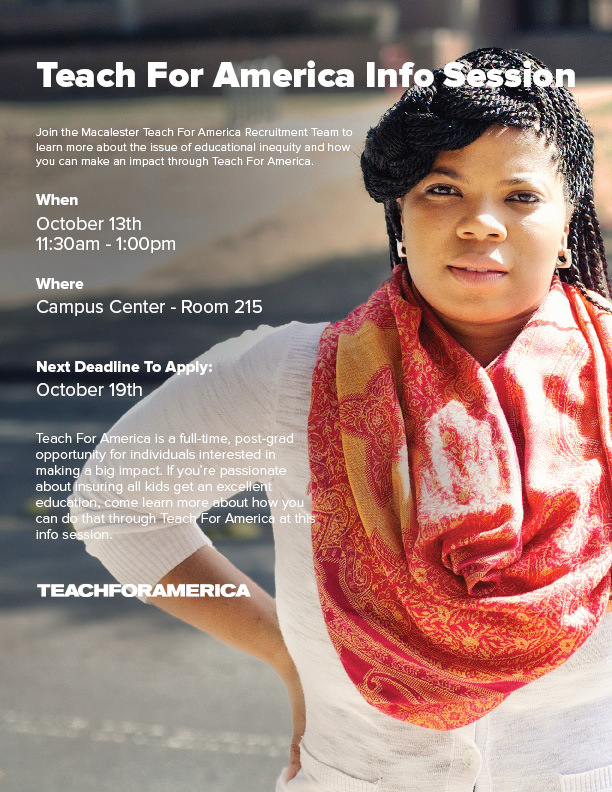 There will be a presentation / q&a session at Macalester Thursday, Nov. 19th at 4:45 pm, CC 215. Applications are due by 11:59 p.m. on November 30. The Tufts Historical Review Editorial Board calls for submissions to their academic journal of global history that seeks to print papers of the highest caliber. The Board seeks articles – between 2,500 and 8,000 words – that explore the theme “Shadows” from a diverse array of perspectives. Submissions are due January 21, 2016 deadline has been extended to February 1, and should be submitted to tuftshistoricalreview@gmail.com. Please refer to this document for more information. Employers are reviewing resumes now! Attend an info session to learn all your need to know about the Job & Internship Fair. Now is also a good time to register to attend the Fair. The Davis Projects for Peace initiative allows students to spend the summer of 2016 carrying out a grass-roots project for peace, anywhere in the world. Receive $10,000 for your peace project. For information regarding the Projects for Peace application process, etc, see the Institute for Global Citizenship website. Applications are due 8am January 15, 2016. Students are encouraged to apply for an Action Fund grant. Receive up to $1,000 to collaborate with community members on a project to fulfill unmet needs of Twin Cities’ communities. Details and application information available on Civic Engagement Center website. Hemispheres, the Tufts Undergraduate Journal of International Affairs, one of the oldest undergraduate journals in the field, is now accepting submissions relating to this year’s theme of Emerging Actors. Submissions should be research articles, approximately 5000-8000 words, written by undergraduates in a broad range of fields relevant to international affairs. To submit a paper, or if you have any questions or concerns, please contact hemispheres@tufts.edu. Submission Deadline: December 22, 2015. City Internships runs immersive career training programs for college students and recent graduates. They’re designed to expand participants’ horizons and get them job-ready. For each program, on top of hard and soft skill building at weekly career seminars, workshops and networking events, participants undertake an internship placement at one of our partner companies. Students and graduates develop real-world skills, build their professional network and fast-track their career. Friday, November 13th at 7:00 PM, The Cultural House (37 Macalester Street) A gallery and discussion reflecting on the history and future of student activism at Macalester, featuring alumni interviews and Macalester Archives artifacts. The gallery will look at protests and actions of solidarity that the Macalester community has organized, from the 1974 sit in protesting cuts in program funding for students of color, to the Mock Border Wall installed last fall. Light refreshments will be provided. OATI is an energy software solution provider located in NE Minneapolis. They are seeking entry-level candidates for all positions. They are looking for students across a wide variety of majors and interests. For more details on career opportunities, see OATI.com. Available Positions at a glance: Administrative Assistant, Communication Specialists, Software Developers, Electrical Engineers, Customer Systems Analyst, Desktop Support Technician. Please email talent@oati.net or call 763.201.2026 with questions. The American Association of Museums posts national and international museum jobs in: Curating, Education, Development, Exhibitions, Marketing and Communications and more. Marquette University offers graduate programs in History with M.A. and PhD degrees in early modern and modern European History and in United States history, as well as M.A. degrees in Medieval History and in Global Studies Learn more about what they have to offer at their web site here. Click on this link for a list of options provided by our CDC. Wake Forest University in Winston-Salem, North Carolina offers a one-year master’s degree and teacher licensure program. The program has a merit-based scholarship package for admitted students, with a resulting tuition of around $7,000 tuition for the entire program. Applications for the Master Teacher Fellows program are due on January 15, 2016. For more information about the program, see the web site at http://college.wfu.edu/education and/or e-mail Adam Friedman at amfriedman@wfu.edu. To learn about the graduate programs offered at Minnesota State University Mankato, please see the letter linked here. The editorial board of the Chicago Journal of History, an undergraduate publication for historical research at the University of Chicago, is accepting submissions for its Spring 2016 print and online edition until January 25th, 2015. Papers should be submitted to ughistoryjournal@gmail.com as an MS Word or PDF attachment (document title: “Last name+paper title”) by January 25th, 2015. Inquiries and concerns can also be sent to this address. For more information about the journal and to read previous issues, visit cjh.uchicago.edu. “Here and There: Bicycles in Recognition of Refugee Resilience” Join the Macalester community on Thursday, October 29th, in a one-day public art and engagement project recognizing refugee journeys from Iraq, Afghanistan and Syria to seek asylum in Europe. Cycling across borders allows refugees to avoid bans on pedestrian border crossings, and to avoid prohibitions against: the use of public transit, and motorists transporting people who do not have visas. These refugee journeys end with a pile of confiscated bikes at the borders. You can participate by bringing your bicycle and lock to build our own bike pile. Just drop your bike off at Old Main Lawn between 8am and 10am on Thursday, October 29th. Bikes will be monitored by IGC Staff and Campus Security throughout the day. Please contact Pia Mingkwan at pmingkwa@macalester.edu with any questions. The School of Business at Wake Forest University offers a 10-month Master of Arts in Management program. Offering an on-campus information session on Wednesday, October 14th, Campus Center 204, 4:45-5:45 pm. Jemma Brown ’11 won the Kathleen Rock Hauser Prize in Women’s History.